I've always liked the idea of entering the vegetable garden via a gate. With a gate, the garden feels more like an enclosure, a sanctuary, a quiet retreat separate from the rest of the yard. I imagined opening the gate, going into the garden, and having the gate close behind me, as though I'd entered a room. 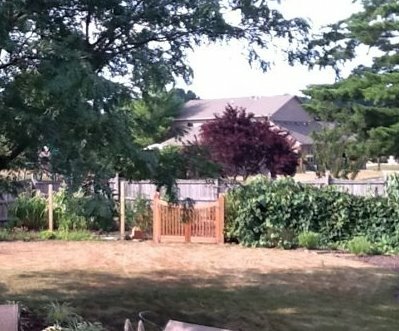 With my vegetable garden already surrounded on three sides by a privacy fence, and then closed off half way across on the open side by a grape arbor, all I really needed was a gate and something to close off the other half of the open side, to complete my dream. Today, I got the gate, built and installed by a local craftsman. 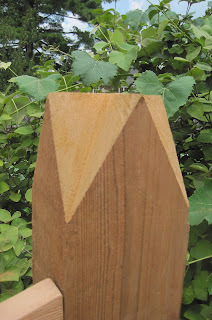 It is one of a kind, made of cedar. It's exactly what I imagined. To the right is the grape arbor, as impenetrable as any fence, meaning that of course rabbits can freely run through it, but I can't. I have to go through the gate. On the other side of the gate, there's a small shrub planted next to the gate to mirror a shrub on the other side that was already there. The rest of that border will be filled with red and gold raspberries, already planted this spring. I'll run wires between those posts to hold up the raspberry canes and then no one can walk through there, either, except of course, the rabbits. But forget the hot days, the lack of rain... I've got a gate now! It looks grand. Don't forget, it's a tradition for fat little rabbits to squeeze under the gate. I like your vegetable garden gate very much, Carol. It's one of the most important places in your life, and the design reflects its importance. Good for you! The gate is lovely and I'm glad it's what you had in mind. 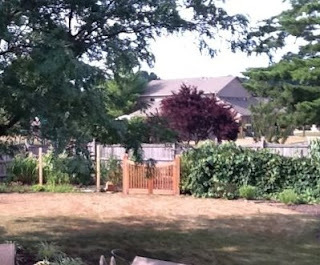 I notice the that the shape of the gate recalls the curve of the privacy fence, which is nice. This is an impressive gate Carol. It looks like you can get a wheelbarrow, tiller, hoe or a lawn mower through there easily. Cedar should keep you in business for a long time. This dry hot spell has been scary. It looks beautiful, Carol. Congrats on the addition! It is beautiful, money well spent. And I agreee: a garden is more like a garden when it has a gate. Isn't it amazing how happy little things can make us? It's an absolutely beautiful gate, Carol. Good for you for having a dream and making it happen! You will get such pleasure going through it every day. :) Congratulations! It truly is a beauty and I love that a local craftsman made it. Enclosure is such an important part of any garden, but very special for a veggie garden. It makes a lovely focal point from the patio, too. Well done! Isn't it nice when you envision something and the reality turns out to match? What a gorgeous gate! Nice design. Nice, I like that embellished 4X4 post in the first pic there. Fabulous! Appearing high on my gardening wishlist is a stable of talented craftspeople to fabricate all the garden structures, accessories and embellishments I can imagine. Score! on finding the creator of your gate, it's lovely.